Nicotiana sylvestris growing herbaceous of the genus Nicotiana also known as Flowering tobacco, Nicotiana sylvestris perennial evergreen or annual used as ornamental fragrant plant, can grow in tropics, mediterranean, subtropics or temperate climate and growing in hardiness zone 10b+ as perennial, 4+ as annual. 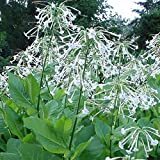 Flower fragrant in white color, flower is like trumpet shape with long pipe, the flowers grow in clusters. 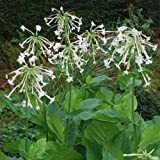 (ANI)~"PEACE PIPE" NICOTIANA~Seeds!~~~~~~~~~~~~Pristine Tobacco Flowers!